Many moons ago, I attended a sprint car race at the legendary Ascot Park Raceway in Gardena, California. It was late on a Saturday night, and driving back to my hotel alone, I thought I'd be brilliant and take surface streets instead of the freeways. Bad idea. Really, really bad idea. As a gringo from Fresno, I had absolutely no business cruising those 'hoods at night. At each stoplight, large groups of the meanest, most dangerous street punks, gangbangers and thugs would stare me down, and I prayed they somehow would get the memo that I wasn't a narc. They would see my white skin and have no idea that I am the least racist guy around, a gentle human who thinks highly of any person of any color – regardless of race – until they prove me wrong. Mixed in with the thugs and bangers are some good kids who are trapped in the ghetto usually by a family situation back in their broken home. The line these kids walk to stay on the good side of the law is a fine one, and most of them just need someone like Robin Petgrave to care about them and their future. If you've never heard of Petgrave, you are not alone. I had never heard of him or the Tomorrow's Aeronautical Museum he founded in Compton, but a story in the most recent General Aviation News caught my eye. Petgrave is my hero tonight, and may be for some time. The "museum" he runs is far more than a traditional museum, it is a flight school, a mentoring program, it is hope. "Sixteen-year-old Jonathan Strickland is barely old enough to drive a car, but he’s already breaking world records in aviation, according to a local program. At Compton Woodley Airport on Saturday, Strickland became the youngest black pilot to solo six airplanes and one helicopter in the same day, said Robin Petgrave, founder of Tomorrow’s Aeronautical Museum. Kelly Anyadiki, a 16-year-old Inglewood resident, also broke a world record and is now the youngest black female to solo four airplanes on the same day." Now that you're an official member we really need your help. We need for you to spread the word about the Aviation Angels to all your circle of friends and those you know who care. This organization will become more powerful if every Angel recruit 5 more angels. Just tell all your friends personally or you can even promote online with cool banners showing you're an angel on your myspace page or other web sites. This pull quote above is the reason for the big yellow banner at the top of this post. I need five of my readers to join this cause and join this museum. If you care about helping a bunch of kids who have spent their lives being told they won't amount to nuttin', this program is the way to do it. Please, please click the banner above, spend a fifty and join up...then email me your name so I can publically thank you on this blog. The next time you are in L.A., stop by the museum at Compton Woodley Airport, 961 West Alondra Blvd. in Compton [map and directions are here]. Meeting these kids might be the most fulfilling afternoon you will ever spend with a bunch of very cool young aviators. And man oh man, if I ever meet Robin Petgrave in person, I just might have to tell him to his face he is the classiest chopper driver in the land. A couple of weeks ago, I met Juice Welch, a twenty something demo pilot for Cirrus Design. 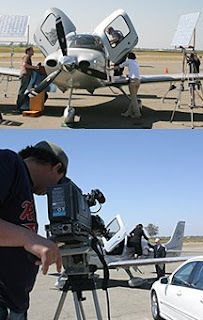 She had so graciously delivered a gorgeous new silver SR-22 G3 to a video shoot for us, and Reedley Municipal was her fourth (or fifth?) stop of the day. You could tell this pleasant young woman was a true aviator when she rattled off her itinerary for the day...SMO to San Carlos, over to Livermore for lunch, back to SMO and then up to Reedley...arriving about :30 seconds before her scheduled ETA. 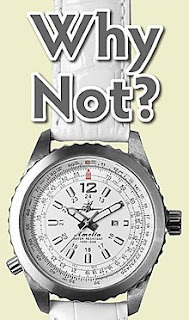 Sure enough, what Juice was wearing was the "Amelia", from a company called Abingdon Watches. I commented that a really serious pilot's watch designed just for women was an great idea, and I wondered out loud who the brilliant person was that dreamed this watch design up. "With Abingdon Watches, Chelsea “Juice” Welch, a Santa Monica, Calif.–based pilot, has launched the first company dedicated to developing top-quality, realistically priced watches to meet the needs of female pilots, mechanics and adventurers all over the world. Abingdon Watches began as a dinner conversation between a mix of energetic women pilots and airplane mechanics. Welch listened as her colleagues repeatedly expressed their desires for a fully functional aviator’s watch that is fashionable, versatile and, most importantly, made for women. In that moment, Juice decided to form the first company dedicated to developing top quality, realistically priced watches to meet the needs of female pilots, mechanics, and adventurous women all over the world." "Act as though it were impossible to fail and use the tools necessary for you to accomplish your goals. When I was a child and I told people I wanted to fly, people would ask me why. I asked them, “Why not?" And nowadays, when people ask me why I started a watch business for female pilots, I still reply back with, “Why not?” There is nothing you can’t do as long as you act as though it were impossible to fail." Juice asks on her site "If you went jogging you wouldn't wear a man's running shoe. So why would a female pilot buy a watch designed specifically for a man?" The gal does have a point, doesn't she? If you have a significant other that is a woman who flies (or wants to fly), I can GUARANTEE you big Brownie points if you buy her one of Juice's watches. Or if you are a female pilot yourself, trust me, you want one of these watches. Yes, this is a sales pitch, and no, I get nothing but satisfaction out of every sale. I barely even know Juice [however she does solidify my theory that I will never meet a Cirrus driver that isn't way cool]. But I believe this is such a great idea, if I were an investor with a boatload of spare change, I'd be on the phone yesterday asking how I could pump enough "support" into this smart company to launch it to the highest of levels of the worldwide watch market. For more information on the coolest watch out there made "for women, by women", contact Abingdon Watches at (310) 736-5673 or visit www.abingdonwatches.com. 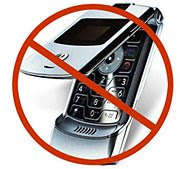 "Introduced in House: To amend title 49, United States Code, to establish prohibitions against voice communications using a mobile communications device on commercial airline flights, and for other purposes." "A commercial mobile radio service or other wireless communications device; a broadband wireless device or other wireless device that transmits data packets using the Internet Protocol or comparable technical standard; or a device having voice override capability." One note on this bill is that it does not apply to "a member of the flight crew or flight attendants" on an aircraft. This is a good thing because in the unlikely scenario when gremlins take an airliner's radio system hostage, it will be nice to let the FO use his iPhone to call ATC. The "short title" of this bill shown on govtrack.us is the `Halting Airplane Noise to Give Us Peace Act of 2008'. As any good pilot will tell you, "airplane noise" as defined by us aviators is that wonderful sound when a gigantic radial engine roars by overhead, or the sound that a Piper Cub makes taking off from a tiny grass strip. We make a mass exodus each July to Oshkosh just to flood our ears with "airplane noise" and we've never met an airplane that makes bad noise with the engine(s) running. Maybe they should have called this the "Any Idiot Who Uses His Cell Phone In Flight Will Get Tossed Off the Ship Like D.B. Cooper Act of 2008". [verbatim from govtrack.us] This bill is in the first step in the legislative process. Introduced bills go first to committees that deliberate, investigate, and revise them before they go to general debate. The majority of bills never make it out of committee. Keep in mind that sometimes the text of one bill is incorporated into another bill, and in those cases the original bill, as it would appear here, would seem to be abandoned. In case you missed that one Civics class in middle school where they explained this stuff, a house bill is first introduced, it is then scheduled for debate before being voted on in the House. If it wins approval there, it goes to the Senate for more debating and more voting. If it passes there, it finds its way to the President's desk where it is hopefully signed, or vetoed and sent back to the maze for more debating and more voting. So the fact that my Congressman introduced this bill is great, but I am not going to get super excited about it until it is actually signed into law by a President. Ask anyone who knows me, and they will tell you I've always been forever in love with Cirrus airplanes, and also Cirrus Design, the company. We won't tell Katy (our Cherokee 235) that there are two giant wall posters in my office, both SR-22s, both beautiful. When I say I have maximum respect for Cirrus Design as a company, I am not kidding. They are just one classy company, and have always delivered on the promise of very well-built, very slick, high-technology flying machines. And while many companies build cool products, more then a few do not do much of anything to help ad agencies like mine promote clients who use their goods. I was flying down to the Reedley Airport outside of Fresno, with Katy loaded to the gills, including two professional actors from Portland. I had no sooner landed and unloaded when I heard a pleasant female voice calling "eight one one Romeo Tango's on a three mile straight-in for three-three, Reedley." The voice was that of Juice Welch, a Cirrus demo pilot who was delivering a gorgeous new SR-22 G3 turbo for us to use in the video shoot. She greased a perfect "no chirper" precisely at 7PM – her planned ETA – with a eye-popping sunset as a backdrop. I was tickled to watch her arrival as my step-son Scott – the Director of Photography on the shoot – captured some amazing sunset/landing footage for our project. It all came together so well, it gave me chills. The day of shooting came off without a hitch [read all about it here], and I came away with even more respect and admiration for Cirrus Design and the many fine people they have in their organization. They didn't have to help us, but they did. They didn't have to route Juice and her beautiful SR-22 through our world so it could be the star of our show, but they did. And sometime off in the future, I am going to return that favor to Cirrus big time. It would be an honor to use just about anything in my skill set to help such an awesome company sell more hardware. But if I have to spend a weekend washing every plane on their production ramp to say thanks, it will be 48 hours of wet, soapy bliss. Pilots help pilots. Because it's what we do. With each passing day, every American is being held hostage at the gas pumps by skyrocketing prices that show no signs of abating. Is it that "they" don't think we'll notice $3.99 regular or $7.99 Jet A, or is it that "they" don't care. And if you've been around this planet for the last seven years or so, you most certainly know who "they" are. "Delta and Northwest, seeking to combine to create the world's largest airline, posted losses Wednesday totaling $10.5 billion for the first three months of the year due to exorbitant fuel prices and write-downs of their companies' value. The figures from Delta and Northwest follow large losses at other carriers, such as United Airlines parent UAL Corp., which earlier this week reported a $537 million first-quarter loss on higher fuel costs, and likely rank among the industry's largest quarterly losses ever." "Exxon Mobil made history recently by reporting the highest quarterly and annual profits ever for a U.S. company, boosted in large part by soaring crude prices. Exxon, the world's largest publicly traded oil company, said 4Q 2007 net income rose 14% to $11.66 billion, or $2.13 per share." "BP, Europe's second-biggest oil company, posted a 53 percent jump in fourth-quarter profit as production rose and increased its dividend. BP climbed as much as 3.5 percent in London trading after boosting the payout by 31 percent from a year ago. Net income advanced to $4.4 billion." "Soaring oil prices lifted Chevron Corp.'s annual profit to $18.7 billion in 2007, the fourth consecutive year that the San Ramon company made record amounts of money." If that has disgusted you, I'm not EVEN getting started. A table that accompanies Austin's story shows the "break-even price" for Kuwait at $17 a barrel USD, a "a key measure" determined by the amount of money it takes to extract 1 barrel of oil. At a market price of $100 for that same barrel, Austin's charts show that cost of extraction and production is multiplied an unbelievable 488 percent! I briefly jumped around the Internets after seeing this to try and prove these numbers wrong...but found similar "break-even" prices listed on other reputable-looking sites. As all data on the web is to be taken with a considerable amount of skepticism, all versions of this "break even price" story are generally in the same range regardless of writer, so I think Austin's take on this is right on. This is a sad, sad time for our country. I sure hope the airlines can hang on until new leadership can be elected to the White House. And if that leader is John McCain, we are SO screwed. Now I will admit that I've never picked up a copy of the London Daily Mail, so I can't tell you if it is a straight-up media source, or a tabloid. I am sure any British readers will set me straight on that. "The head of the RAF has "erupted" with rage over revelations Prince William landed a £10million RAF helicopter in girlfriend Kate Middleton's backyard during a military exercise. Air Chief Marshal Sir Glenn Torpy is said to have been furious at the 'sheer stupidity' of the situation and demanded a "line-by-line" explanation from subordinates." According to The Mail – and again I do not know if this is fact or fable – they say Middleton and her parents "watched in delight" as the Prince practiced take-offs and landings in the yard of their sprawling home in Bucklebury, Berkshire. Even if this was an "official" training exercise, you have to admit it takes a pretty big set to drop in on your lady in a CHINOOK! What, there was no shining armor handy? "Details of the two-hour stunt emerged just days after the prince was heavily criticised for using a Chinook to fly himself and brother Harry to a stag weekend on the Isle of Wight. Last week it emerged that after getting his much-coveted wings, William flew a Chinook to London and landed at Woolwich, where he picked up his brother and fellow army officer Harry. They then flew to the Isle of Wight where their cousin Peter Phillips, the son of Princess Anne, was enjoying a weekend-long stag party. The flight enabled them to spend an extra five hours touring the pubs of Cowes where at one point rowdy revellers pulled down William's trousers." From a quick glance around the British media tonight, there seems to be no shortage of bad vibes about one of the most visible of the "Royals" blasting off across the lush English countryside chasing way more then hamburgers...all on the taxpayer's dime. I can see no way this ends well for the reputation of the dashing Prince, who might want to just BUY HIS OWN CHINOOK with the spare change his Grandma has stashed under those gilded throne cushions at any of the many palaces and castles that her family calls home. Greg Perry is just your average guy, a 42 year-old magazine publisher out of Huntington, West Virginia who likes cars, autocross, NASCAR, home improvement, and someone named JuliaK, so says his Blogger profile. Greg has wanted to fly for 35 years, which means he discovered flying machines at about seven-years-old. And like me, and so many other pilots, he has waited patiently for the stars to align in his life, and finally began the process of earning his pilot's license in March of 2008. 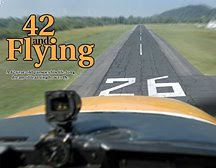 Now I read quite a few aviation blogs, but "42 and Flying" stands out in the crowd. Why? For the same reason Ernest K. Gann stands out...the writing. Perry's keen ability to string the right words together to form really interesting stories makes his blog flow effortlessly from cyberspace to your brain. As a description of the "fun, fear and frustration" of flying, it is worthy of praise from a guy like me who has been getting paid to write for my entire adult life. "We enter the left-hand pattern at HTW, and Nelson [his CFI] again is relating to me all this information in his relaxed, easy-going way. "You're going to land this puppy," Nelson says over the headset. Totally out of the blue. I am stunned. "Oh, I'll help a little bit, but you'll do most of the work," he says, and takes his hands completely off the yoke to illustrate the point. Great. We're at 1,500 feet and descending at 3-400 feet per minute now, the engine at idle, and there's two guys in the airplane: One of them has landed a plane before. One of them has not. If you think this has the makings of a classic mathematical question on the SAT, you're right. If two men are in an airplane traveling 65 mph, one of them has landed before and the other has not landed before…what are the odds of the plane safely making it back to earth without a huge fireball as the finale? Nelson talks me down, down, down. It is a little unsettling at first, but you MUST get used to the sensation of no power and descending at a controlled rate. That's all a landing *truly* is, a controlled descent (some say crash) to the ground. Base leg, and I turn the plane on final, pointed right at the numbers of Runway 26. Nelson reminds me not to push the nose down, it'll go there all on its own. The plane practically flies itself toward the runway numbers, just over the trees that are at the edge of the runway. The engine has been idling since the downwind leg. The number 26 gets larger in the windshield, and I'm doing my best to keep the plane straight. About 10 feet off the ground, the mystical Ground Effect takes place, and I pull back on the yoke. Nelson adds a little more back pressure using his yoke, and we settle right onto Runway 26 as pretty as you please. Other than that last-second application of back pressure, Nelson's hands were off the yoke. I landed 40Golf pretty much by myself today. Just call me Maverick, honey." If you have been there and done that, you will agree Perry's writing is spot on. So pour a cold glass of whatever gets you wound down, go visit "42 and Flying" tonight, and enjoy. Oh, and be absolutely sure to bookmark his blog, because I can guarantee this will be a wild ride that we will all want to take with him. The best part is that Perry can carry us all along on future flight lessons without worrying about weight and balance or being over gross. Hope we don't make him nervous, with a couple of hundred blog readers looking over his shoulder. There can be no disputing the fact that as fuel costs rise and our economy teeters precariously close to the edge of a full-on depression, people all over the country are choosing to hold on to any extra cash they somehow managed to collect. If you have a dream to learn to fly, and if you're still are getting a check from a job that has yet to be sent to China, chances are you've chosen food, housing and gasoline for the mini-van over flight instruction. One of the biggest threats facing general aviation is the dwindling pilot population, and that's why AOPA is turning to you for ideas on how to reverse that trend. "Take five minutes and tell me what you'd do," implored AOPA President Phil Boyer. Share your ideas in this short online survey. 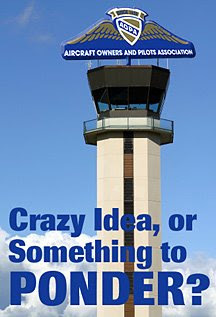 So far, hundreds of members have responded to Boyer's call to action published in the May issue of AOPA Pilot. "But that's not enough. We need ideas from every AOPA member," Boyer said. "This issue is as important as the user fee fight, and the more information we have, the better we can tackle this problem that threatens the very heart of aviation." A pitch in the latest AOPA Pilot Magazine featured an appeal from Boyer and a personal request for members to take the short survey. According to AOPA, you've followed that instruction well, with "more than 600 pages of high-quality opinions and ideas" received by the middle of last week. (Q) In general, besides cost, what do you think are the major obstacles that keep new people from learning to fly today? Please limit your response to 75 words. (Q) Let's say you were sitting across from someone who had the time and financial resources to learn to fly. What would you say to that person to convince him or her that they ought to take up flying? Please limit your response to 150 words. (Q) If the job of recruiting new adult student pilots was entirely up to you and you had the full resources of AOPA to back you, what would you do to convince more people to learn to fly? Please limit your response to 500 words. These young people are all very well-connected and once they get their ticket, will be talking [texting?] general aviation to their close circle of friends. The 5,000 new pilots each year will be the seed that keeps GA growing as our pilot population ages. What I proposed to AOPA was that they begin a nationwide version of my Welcome Sky Aviation Scholarship Program that I developed at Fresno Chandler Downtown Airport several years ago. It's a simple concept – sort of a 'Robin Hood' style of developing funding – where rich pilots with extra cash lounging around their bank accounts take that cash, pool it, and pay for full-ride flight training scholarships. The recipients of these funds are really sharp kids who have written essays on what it would mean for them to learn to fly. In the few years I pushed Welcome Sky in Fresno, we managed to produce four new private pilots, and I know this system works. I have never had the means to administer it nationally, but I know AOPA does. Just my two cents, because they asked for it. We bloggers love to bang on the mainstream media any time they get an aviation story wrong. You know the drill, when you open the morning paper and read that a "twin-engine Cessna 172 with eight people on board" has crashed. "As cash-strapped airlines pack more passengers on flights into ever-busier airports, pilots are filing internal complaints warning that airline cost-cutting on fuel supplies could be creating a major safety risk. The complaints, compiled by msnbc.com and NBC News from a database of safety incident reports maintained on behalf of the Federal Aviation Administration, reveal wide-ranging concern among pilots that airlines are compelling them to fly with too little fuel. With the cost of jet fuel having doubled in the past year, according to Energy Department figures released last month, airlines are eager to save fuel costs." "MSNBC.com reviewed more than 5,000 voluntary incident reports filed by pilots and first officers with the Aviation Safety Reporting System. All filings in which flight crews declared “minimum fuel” or more critical “fuel emergency” situations were examined for those in which crews either declared the fuel problems after having requested extra fuel before takeoff or specifically alleged that they took off with inadequate fuel for conditions. The filings examined for this article reflect the sentiments only of pilots who chose to file reports and to include specific commentary on why they thought the incidents arose." With fuel costs skyrocketing, it is easy to see how the airlines would want to cut back anywhere they can on fuel. But as any PIC knows, the safe outcome of that flight rests on the shoulders of the Captain, who needs to be the last word on fuel on board. If this MSNBC is true – and I believe it is – this is just more of the same from the an industry who just recently got busted big time for trying to slide in under the FAA-mandated inspection regs. It is not a stretch for this cynical outsider to visualize a corporate world of Big Airlines who would require dispatchers to supercede the fuel orders of the Captain. As each day passes, we the people lose faith in most of the Big Airlines, and this story doesn't help earn back our confidence. So go here and read this story, it is a very good example of how investigative journalism used to be conducted, back when reporters had the balls to really get their hands dirty. Reporters Johnson and Stinchfield go at this story from every conceivable angle, leaving no stone unturned. Oh, and Grant Stinchfield has a great blog post on this story, for more information. 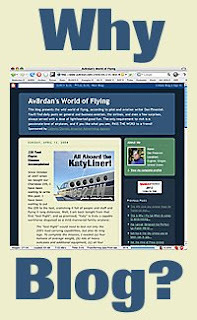 I received a long email from a frustrated reader recently who wants to "unsubscribe" from World of Flying due to a laundry list of issues far too lengthy to address here. Absolutely no skin off my nose – my readership continues to grow daily – but it made me think about why I pound out near daily posts and rants mixed with a little poked fun once in a while. I turned off comments long ago after finding no real solution to prevent dope dealers from trying to sell me knockoff Viagra, and Nigerian zillionaires sending me invitations to "help" them take a few million out of their country. Of the one occasional real comment I received, I got about 10 spam comments. Sad to say, nothing in the Blogger system seemed to work to prevent this. So I choose to just make a nice clean "Email Me" link, so that when people really had something to say, they could reach me. This is how I see politics on the blogs: There are now so many blogs out there on the Internets, you can find one for anything you choose. Save the whales, nuke the whales, there is a blog meant just for you. So when you run across one that tilts in a direction you do not, it is really, really easy to click through to one that does. 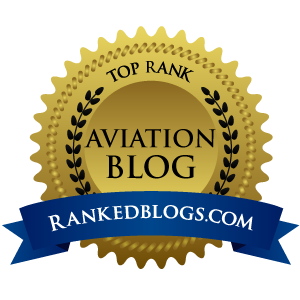 I blog because I love to tell flying stories. 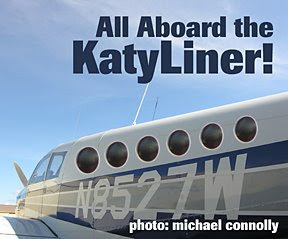 The frustrated reader tells me that my recent posts about Katy – our family 235 – made him run to open a copy of Controller for a little airplane shopping, a compliment I really enjoyed to read. I believe the most important job that my blog can do is inspire people to learn to fly. Those happy flying tales they see on WoF really do make me warm and fuzzy inside when I write them. But if all I wrote was warm and fuzzy, I'd get complaints that I didn't write enough flames of BushCo and his band of GOP cronies. Trust me, it is very hard not to hurl daily word attacks at an administration run by a frat boy that tells the Pope he made an "awesome" speech. 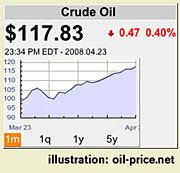 It takes great restraint not to bash those who think $114 for a barrel of dead dinosaurs really is sweet for crude. The GOP gives us bloggers so much good material each day, it is hard sometimes to think [or blog] about anything else. I blog because it is simply a blast. The aforementioned frustrated reader might actually think I take this stuff seriously, which I do not, trust me. Blogging to me is a way to give my brain a few minutes off from reality, and if I yank a few chains, so be it...isn't that the very essence of the First Amendment? I do not plan to change the world with this blog, I'd be elated to just push a few souls out to the airport on the edge of town so they can take that first flight lesson. But in the interest of proving I don't have thin skin, Mr. Frustrated Reader did make some very valid points, some of which I take to heart. So you will find a nice fat "FEEDBACK" button in the upper right part of this page. Click that and you're compliments [or flames] will get delivered straight to my inbox. Send me spam and I will promise to send you back boatloads of bad karma, and believe me when I tell you...my bad karma is REALLY bad. "Delta Air Lines announced a long-speculated deal to acquire Northwest Airlines Monday, a combination that will create the world's largest airline and could lead to a series of other deals to reshape the U.S. airline industry. The deal could lead to less competition and higher fares on some routes where the two carriers now compete." That last sentence should tip you off to what is really going on here. In case you just landed on this planet from, say MARS, present-day Washington D.C. has but one purpose in life: Create a business environment in the United States that allows the one-percent elite to plunder the wealth of the other 99 percent of us by making as much profit as possible on anything they touch. You have to look no further then the corner gas station to see what I mean. "On April 9, the Department of Transportation tenatively approved a suspension of antitrust laws for several members of the SkyTeam alliance - Delta, Northwest, Air France, KLM Royal Dutch Airlines, and two other international partners - with the object of combining trans-Atlantic operations and operating as a single carrier for flights between the U.S. and Europe." "The Justice Department pledges to take a look at how the proposed merger of Northwest and Delta will affect consumers. But analysts see the deal eventually winning regulatory approval. The airlines say they want to complete the transaction by year end, in the closing window provided by the presence of the Bush administration, which is seen as largely merger friendly." The only people who think these airline mergers are good for the industry are the very top managers of the merged carriers. Everyone else, including the pilots who fly the passengers who will get screwed in this deal think the mergers are a huge mistake. And if you think these airline mergers will ever result in lower prices, you're head is buried deep in GOP quicksand. The "test flight" would need to test not only the 235's load carrying capabilities, but also its long legs. To complete the mission, I needed (a) four humans of average weight, (b) lots of heavy suitcases and additional equipment, (c) all four fuel tanks topped completely off, and (d) enough miles in the flight plan to test the wonderful range reputation the make/model has. The test humans were myself, wife Julie, son Michael and his lovely wife JJ, with an average weight of 177.5 lbs. The baggage, camera and computer equipment weighed in at an estimated 175 lbs. Add 504 lbs. of distilled dead dinosaurs in the fuel tanks, and Katy would be just an ounce or two below her maximum certified takeoff weight of 2,900 lbs. Our mission profile was demanding. Fly direct into tiny Reedley Municipal Airport just east of Fresno for a quick photo/video shoot for the agency, blast off up to California's Wine Country for a wedding, and return home the next day. Katy would have to haul the four of us and all our stuff from the middle of Oregon to the Middle of California, without complaint on a very tight schedule. Yes, there are a few squawks that need attention. I am not at all amused that the main gear's oleo struts developed an attitude when pushed to their max weights. One was up, the other down, then both down, then both up. And in both directions, Oakland Center had trouble "seeing" my Mode C in the vicinity of Mount Shasta. Funny though, while the same center was complaining about my blip up and back, all other of ATC's finest from Oregon and California had no problem with my old vintage transponder. Might be because I was flying in the vicinity of the Oregon Vortex, who knows. Conclusion: I am very, very pleased that this seasoned girl we call Katy handled this critical mission with the precision I required. It was one part cargo ship, one part luxury liner, one part economiser and one part family cruiser. I could not ask anything more of the 235, it served us well. It burned exactly how much fuel I expected, hit my route times within a few minutes on all legs, hauled an AMAZING amount of weight, and looked damned good doing it too. While I have nothing but respect for such legendary planes as the Cessna Skyhawk, I have owned a 172, and as a XC hauler, it left something to be desired...you always had to leave that fourth person back on the tarmac. I told myself that I would not get back into airplane ownership until I could afford a plane that can haul four adults and all their stuff to California. And tonight, that ship is sitting in my hangar. When it comes to determining if management in any sector is steering their ship properly, it is always very easy to sort the "hot" companies from the "not" companies. 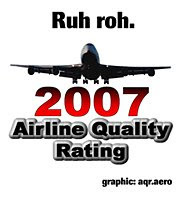 When a damning report such as today's Airline Quality Rating (AQR) surfaces about your industry, it is painfully easy to see which companies have "tuned in" brass at the top, and which ones are suffering from "Industrial Disease", to quote a favorite Dire Straits song that seems – in the case of most U.S. airlines – to be oh so apropos right now. "Late flights and lost bags, to say nothing of higher fares, are making air travelers grumpy, an annual survey of airline quality says. The industry posted declines last year in every area of the Airline Quality Rating, amid rising fuel prices, safety problems and bankruptcy filings that shut down three carriers last week alone. The biggest change was in the rate of consumer complaints, up 60 percent overall. The rate more than doubled at US Airways and Comair, and rose for 15 of the 16 airlines included in the study. The exception was Mesa Airlines. On-time arrivals dropped for the fifth straight year, with more than one-quarter of all flights late, according to the survey. The rates of passengers bumped from overbooked flights and bags lost, stolen or damaged also jumped in 2007." "The General Aviation Manufacturers Association (GAMA) announced that the 2007 year-end shipment figures for the general aviation industry have led to another record high in industry billings, which totaled $21.9 billion, eclipsing last years’ figure by 16.5 percent. Year-end, worldwide shipments of general aviation airplanes totaled 4,272 units, the most in more than a quarter century and up 5.4 percent over the previous year's total of 4,053 units. Aside from the record set for year-end billings, the industry also experienced an all-time high in business jet shipments, delivering over one thousand units for the first time in history. Business jet shipments reached an all-time high of 1,138 units, up 28.4 percent over last year’s figure of 886 airplanes." This is why I am so very proud to be a pilot...and an airplane owner. This week, I am planning a flight in our family Cherokee 235 down to Central California for a photo/video shoot, and then will be departing that evening for a quick jaunt over to the Wine Country for a wedding. We are lugging lots of photo gear, oversized tripods, wardrobe for the models, the works. It all fits perfectly in Katy's cargo hold, and VFR weather permitting, this flight will be easy and convenient. It is a trip that is scheduled tight, and would be impossible to do in the world of the Big Airlines. I am flying right into the little airport where we are doing the shoot, and then right into the Wine Country...direct on all legs right in the backyard of my destination. Sweet. Flying your own airplane should be the goal of any business person or company in 2008. If you have a decent-sized corporation that spends a fair amount on commercial air travel just so your people can get frustrated about arriving late without their baggage, why don't you just buy a Pilatus PC-12 and begin your own flight department? If you don't want to hassle with starting a flight department from scratch, why not just buy a fraction of a PC-12...the financials on fractional ownership of a Pilatus make great sense. Whether you operate a big turbine-powered people mover, or just charter Cirrus SR-22s when you need to be somewhere without any airline hassles, in most flight scenarios, you will beat the daylights out of the airlines. And if you compare customer service between flying yourself or chartering a private plane versus the Bigs, it is a bloodbath...the airlines don't even come close. That is why I fly GA... to avoid being herded across the sky like cattle by a big, clumsy, out-of-touch airline who plays a shell game with their FAA maintenance records and thinks overbooking a flight is an ethical means of turning a profit. If you want to begin avoiding the airlines by earning your pilot's license and buying your own GA plane, a few good places to start are Cessna, Cirrus and King Schools. We've all known Lancair International has designed some of the coolest flying hot rods in the sky. Every Lancair is a work of art, and they all scoot through the sky with performance that would have blown the mind of either Wright Brother. Lancair is introducing the Lancair Evolution, the most technically advanced, performance-driven aircraft ever. Developed entirely through Computer Aided Design, the Evolution will shatter all your pre-conceived notions about aircraft performance, control and safety. A powerful PT6 engine by Pratt & Whitney propels the Evolution to speeds of more than 385 miles per hour. The performance of this plane is just amazing. With a rate of climb of 4,000 fpm, it takes just eight minutes to reach FL240...yet stalls at just 61 kts. The pressurized Evolution has a maximum operating altitude of 28,000 feet, yet burns just 39 gallons per hour. All major structures are installed for you in the wings, horizontal stabilizer, elevators, and vertical fin. The fuselage also sees major component installation performed for you using our massive alignment fixtures, which include the firewall, nose gear tunnel, engine mount, nose and main gear assemblies, fuselage bulkheads, etc. Also included is the wing mating feature that aligns and attaches the wing into the fuselage. Main gear doors are also trimmed out for you. Recently added to our pre-assembly is the wing fuel system that includes fuel caps, drains, slosh doors, pickup and return line fittings, vent lines, and tank sealer. It will take you about 1,500-1,700 hours to build the Lancair IV-P/Propjet/Sentry. These hours do not include firewall forward installation, electrical, paint or upholstery. The kit includes all the major components of the airframe, but no engine, propeller, avionics, paint or interior. When a Propjet/Sentry is done, you will have spent about $400,000- $450,000. And if you would like builder assistance from Lancair, you can spend up to 26 weeks (possible more for the Evolution?) with them and will build your own plane under their watchful eye. Lancair technicians offer technical assistance and guidance during this build time, at a cost of $4,000.00 per week. Now I must be honest, I'm a guy who would never attempt to even change the oil in my Cherokee 235, so building an airplane is far outside my realm of imagination. Having said that, wouldn't it be super groovy to go to Lancair, spend several weeks in their Builder Assist program...crafting your very own Evolution? I can think of no better aviation moment one could enjoy then departing Roberts Field in Redmond, Oregon in a 385 mph, fire-breathing rocket ship you built with your own two hands. On Thursday, low-fare carrier ATA Airlines Inc. said it has filed for bankruptcy court protection, grounding all flights, laying off nearly all 2,230 employees and stranding thousands of passengers. The Indianapolis-based airline became the second U.S. carrier this week to end passenger service. On Monday, Aloha Airlines ended passenger service, grounding the only carrier offering nonstop flights from Orange County, Calif., to Hawaii. And in Washington, D.C., wire reports are everywhere describing testimony to a Congressional committee by whistleblowers who have exposed a "culture of coziness" between FAA inspectors and the Big Airlines. These inspection lapses have led to massive maintenance and inspection problems that has serious jeopardized passenger safety. This testimony prompted Rep. James Oberstar, D-Minn. to say that FAA management actions displayed "malfeasance bordering on corruption," adding that if presented to a grand jury, the evidence would result in an indictment. And as BushCo and their Saudi buddies snicker about high oil prices, the cost of 100LL and Jet A continues to skyrocket. Friday at Newark Liberty International Airport, "off the truck" Jet A was priced at $7.99 a gallon. Nobody can be sure that either Barack Obama or Hillary Clinton will be able to claim the White House and clean up the mess that the Bush Administration has made of what we used to know as "aviation" in the United States. Either one will have a very full plate cleaning up a million other disasters that BushCo will leave us, starting with the Iraq war but certainly not ending with our limping economy that may be headed not to recession, but a possible real-life, 1929-style, soup kitchen depression. 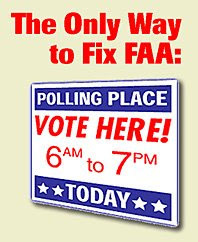 If you are a pilot that has concerns about the direction the FAA has taken in the last seven years, please do not vote for at least four more years of business as usual. Let the other team give it a try. There are no guarantees they can clean house and get the FAA's ship righted, but since we are absolutely sure now that "stay the course" hasn't worked out any better than "No Child Left Behind", what have we pilots got to lose by letting the left side of the aisle attempt to steer the ship for a few years? So please vote next November. And if you're a pilot that has some kind of problem voting for a black guy or a woman and you end up voting for McCain by default, you are a stupid bigot that IMHO does do not deserve to fly in the same sky as the rest of us. This week, United Airlines – the largest U.S. operator of Boeing 777s – decided to ground its fleet of 52 of the wide-body jets to make required checks of the planes' fire-suppression system. United canceled 38 of its 84 daily flights scheduled to be flown with 777s. The inspections come on the heels of a $10.2 million FAA fine proposed against Southwest Airlines Co. on March 6 over missed inspections. "The White House press charter that ferries journalists, presidential staff and Secret Service agents whenever the president travels has been grounded. The chartered jumbo jet is one of the 52 Boeing-777 aircraft that United Airlines ordered out of service today until it can inspect them for possible problems with the fire suppression systems in the cargo holds. The jet is currently here in Bucharest, where President Bush is attending a NATO summit that opens tonight." "United is scrambling to find a way to inspect the plane quickly to avoid messing up the president's European trip, possibly by dispatching inspectors here to Bucharest or maybe flying the plane somewhere else for a quick check and sending it right back. Fortunately for everyone, Bush is on the ground here for another couple days before heading to Zagreb, Croatia, on Friday and then Sochi, Russia on Saturday. That should be enough time to get the plane checked out and back ready for service in time for Bush's departure." A stroll through the comments left today on wapo.com shows the public doesn't have much mercy for these wayward scribes. I will spare you the pummeling the White House Press Corps took on this, and will state – for the record – that they do not deserve it. I was a real journalist once, and while Sports Editor at the Poe-Dunk Tribune is not exactly covering Baghdad for Reuters, I know that without question, the hardest job in journalism for the past seven years has been that of a White House correspondent. Why? Because you have to get up each morning and trudge into the Briefing Room knowing Bush's Spinner du Jour will look you straight in the eyes and tell you a string of half-truths and fractured fairy tales each more unbelievable then the one before it. Man, that has to be torture, being Dana Perino's punching bag, day after stinking day. I hope they all get a precious few hours off over there and can wash their sorrows down with some of whatever the local pubs are selling. My guess is that those tankards might be filled with some sort of potato-flavored vodka...just a hunch. Every year on this most foolish of days, Aero News Network runs a bunch of April Fool's stories that are absolutely hilarious. I love to scan them and start my day with a belly laugh, but one of them really got me thinking. Remember fans, this is only a joke...or is it? Aero-News has learned that intense negotiations between officials of the Aircraft Owners and Pilots Association (AOPA) and the Federal Aviation Administration (FAA) have resulted in an end to the long impasse over user fees on general aviation. House Transportation and Infrastructure Committee Chairman James Oberstar, a Minnesota Democrat who's been involved in the talks, said the negotiations reached a turning point when AOPA proposed splitting the air traffic control system at 18,000 feet MSL, with the flight levels and airline hub airports to be administered by the FAA, and the lower altitudes and smaller airports regulated by AOPA. The compromise means most airline traffic will operate under FAA control, and most small GA aircraft will fly within the AOPA system. Since the bulk of us GA pilots plod along below the "flight levels", maybe that FL180 ceiling should indeed be the floor for airplanes controlled by the FAA. Maybe some other agency would be better suited to control the slower, non-pressurized crowd below 18,000 MSL. At least placing the dividing line between small iron and big iron at FL180 would sure make it easy to see who needs to pay more for FAA ATC services. Now before NBAA goes ballistic on me saying this is a call for user fees above FL180, it is not. What is is though is a call for NO USER FEES below FL180! I would not be the first to throw the theory out there that maybe those who do fly high and fast need to stay in the dogfight against the FAA on user fees, and those who fly below that altitude should be immediately waivered from any future user fees. Just food for thought, nothing more. But it sorta kinda actually makes sense that those flying up high in $58 million dollar Gulfstream G650s could perhaps pay more to use the ATC system then a gal dinking around the countryside chasing hamburgers in her Luscumbe. We already know that the G650 guy has already paid a boatload of EXTRA FUEL TAXES is in fact already paying much more to use the system, proving once again that the current system of funding FAA is working just fine.